A porcelain tile floor creates a luxurious and opulent look to any room. The beautiful appearance of the tiles is only made better by its durability and longevity. We stock premium brands that are virtually maintenance free, making them an easy choice for any homeowner to keep in excellent shape. This makes tile flooring a much more sensible option than carpeting for busy professionals with full schedules. Ragno—A leader in the Italian ceramic tile industry, Ragno tiles has been setting the standard for beautiful functionality since 1949. Once only available in Italy, new technology has allowed the company to offer the same remarkable quality and intricate detailing all over the world. Panaria—Panaria is an avant-garde ceramic company that offers stylish and trendy designs in floor and decorative tiles. All of the Panaria tiles are designed to make every home like a palace of dreams with intricate details and beautiful accents. Mediterranea—Meditteranea tiles use a unique manufacturing process that incorporates dynamic HD imaging to make the look of every tile striking. With Italian-based designers creating cutting edge products, a Meditteranea floor stands out no matter what room you place it in. Many of the porcelain floor tiles in our Marietta showroom are environmentally friendly and perfect for anyone who wants to do their part for the planet while still having the best of everything in their home. Ask about our options for flooring that incorporate recycled material. You may be surprised to find that they are every bit as beautiful as any other flooring type. Imagine walking into your bathroom and seeing natural light without feel exposed. 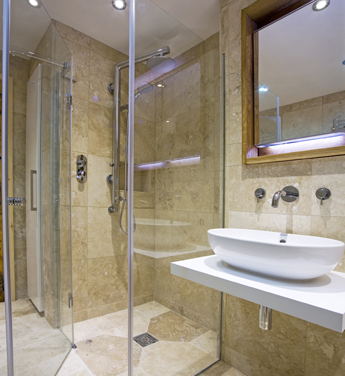 Instead of a large window, homeowners can add versatile glass block tiles to their bathroom suites. Glass block tiles are available in all shapes and sizes. In a few short hours, this easy installation can change your space for the better and brighten your room. Look no further than our tile store for the most experienced installation experts in the area. 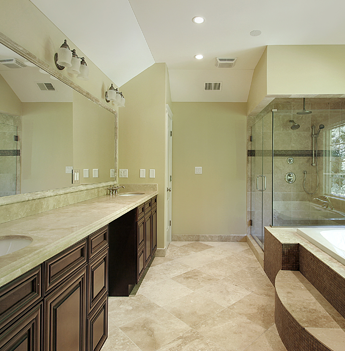 Purchasing travertine tile is a popular choice because it is an elegant style that withstand years of wear and tear. Tiling an entire home with travertine transforms the space into an upscale environment that is simply stunning. However, you don’t want to install it yourself. Protect your investment and update your home by trusting our professional team for travertine tile installation. Our installers have the tools and expertise to properly cut, transition, and place your travertine as desired. Add an artistic element to your home or business. At our glass tile store, we carry a wide variety of beautiful and affordable products. From kitchen backdrops to swimming pool features, our store has the right size and color to match your design preferences. If you need help choosing, our specialists can assist you in making the right selection for your existing décor. Contact us today to learn more about the options available in our expansive showroom. There is something in our showroom for everyone. We proudly serve customers in Marietta, Roswell, Atlanta, Alpharetta, and Kennesaw, Georgia.